Happy Monday everybody! I made this poster at FofoFlexor, and it is pretty neat! This cactus, known as Thimble Cactus is so cool with it's round balls and pure white star shapes spines! It is a cutie pie! I will check these buds tomorrow morning and see if they are open and will do another post as soon as they do! Maybe another poster????? LOL....Having fun! HELLO, HELLO!!!!! How's everybody doing? I had a wonderful Thanksgiving, and am looking forward to the start of December in just a few days! Can you believe how fast this year has gone? WOW! The most disturbing thing happened to me this morning! I had seen a lovely shoot of yellow flowers on a long stalk coming up from a little aloe plant in my tires, right outside my kitchen window, so I ran out this morning to take pictures, and found out it was a darn flowering WEED just in front of the aloe!!! OMG! I was so sad. What a let down! I snatched that thing out by the roots and threw it as hard as I could down on the ground and cursed at it! LOL. Anyhoo... my kalenchoe is growing very tall, ready to make it's very unusual flowers, and it just hit me how it had some really beautiful parts to it, so I did a little photo shoot with it. Sorry my camera is so crappy and I could not get perfectly sharp pics of all areas...but hopefully you can get the idea of how pretty it is. I keep it in a strawberry pot to contain it, and it has actually been VERY enjoyable. If it grows too tall or wide, I just trim it down and then it makes for even more beauty. 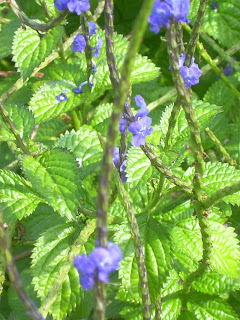 Even though it can be so invasive and crazy, it might be a top contender for giving me the most JOY all year long. I think it is particularly lovely in the strawberry pot. What do you think??? Have a wonderful holiday everyone! I have my stepson here and more family arriving tonight so I will not be posting until after Friday, more than likely. I hope to sneak online and read your blogs though, hee hee! I love to sneak. Makes life fun! I hope you all have a blessed, warm, safe holiday. I am thankful for all of you! My submission for Cactus Monday was inspired by some pillows a lady had this last week that she had bought in Cancun, Mexico. They were hand appliqued, and each section was sewn with a blanket stitch around the edge. I also had a wild week this past week betweeen work and cleaning to get ready for Thanksgiving, and I am also anticipating a wild week again with only a 4 day work week! 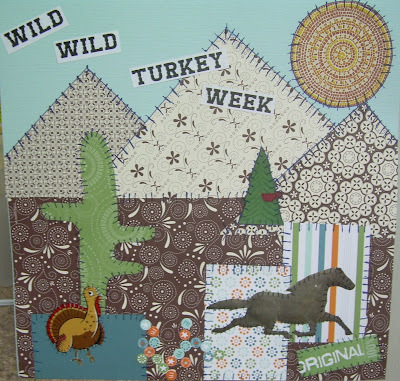 So, without further adieu...here it is "Wild, Wild Turkey Week"! Please do not overlook the Saguaro Cactus!!!! Made free hand with printed cardstocks, added pics from magazines, Sharpie pen, and Wild West Font printed off computer. A touch of craziness, just like we all feel this time of year. LOL. I hope all of your week goes well, and that you have a lot of fun. I sure am grateful for a lot of things, and so very grateful for all of you! I enjoy reading your blogs, all your comments, and learning so much from you. Thanks!!! 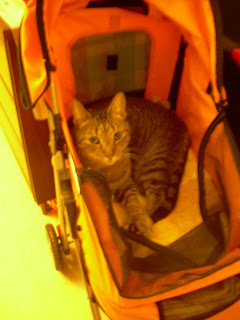 My cat Baby has taken to Doozeys new stroller, which stays parked just inside the front door. Isn't he just adorable in there??? He got named Baby because he was a little tiny baby when we got him 11 years ago. He used to be extremely shy, and now he is a big, worldly, street smart cat, who is not afraid to take over the dogs stroller! YEEOWWW! Good Saturday!!! I was a dummy and had these pics set to load small and all to the left! LOL. I have no idea how this will look when I post it, but I am going to go ahead and do it cause I have to get to cleaning my house to get ready for visitors for Thanksgiving! 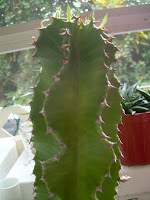 The pics (in no particular order) show the curly edges of my euphorbia (named REX by blogger pal, Serena about 1 year ago) with new leafy growth on the top (weird). The cut rosettes (total of 8, including the top) from my Aeonium...a last ditch effort to save something of it! My "Little Gem" Sedum, which is so cute, and a pic showing this mornings find...a little bud on my PINK Christmas Cactus!!! Yeah...now I know I will have both plants blooming very soon!!! There is a pic at top showing a successful cutting of a beautiful kalenchoe that blooms WHITE! I am excited to have it going strong now! Who is that hiding behind my pot of aloes??? I love my big plastic pelican! LOL. There is a picture of my bonsai Elephant Bush for Pudgeduck, and what is that succulent (3rd pic from the top)? I seriously have no idea what it is called! Is it an escheveria??? My huernia is going crazy...looks like a long armed creature of some sort! Anyway...there are a few pics of what is happening in my screenroom this week! Happy weekend everyone!!! 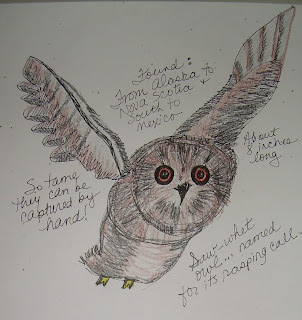 I recieved an award from Sally at Sal's Garden Sanctuary, and just want to thank her for it and extend it on to all my blogger friends who are so sweet and wonderful to always comment on my blog. It is a lot of fun and everyone is deserving of this neat award...so please take it for your blogs as well and pass along the fun! Buds on the X-Mas Cactus! YEAH!!! 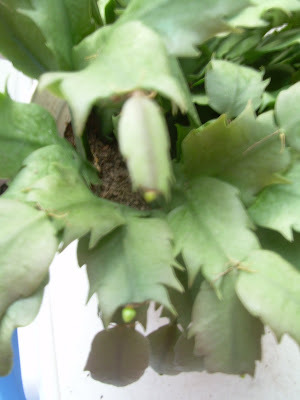 This morning I walked out to check for buds...and I found some on my white-blooming cactus!!! I think I see little teenie start-ups of some on the tips of my pink- blooming plant too! Time will tell. I gave them a good drink (they were on the dry side)...and now I am praying for a lovely show to begin!!! I think I will give them a light application of Miracle Gro tomorrow also. And here is how she looks NOW! I have tried everything. Changing watering schedule, fertilizer, re-potting, change in light levels. I don't think I can save it. Sadly. Maybe this just isn't a good location for them. You know...just writing this out...I am thinking there could be one more thing I could try and that is a sunny window in the house where it is drier air. It's worth a try....I am going out to get her now! Maybe there is hope! Wish me luck! My Mommy calls me a Love Puppy...she dressed me in this silly tee-shirt this morning and said it was because it was "chilly". I wonder what that means??? I feel cozy. I remember this tee shirt from last year when it got "chilly", when a friend of hers sent it to me all the way from England. I think that is somewhere far away. She was nice to send it to me, and I'm not sure I like it all that well...but my Mommy is always holding me and kissing me when I wear it, so I guess it's OK.
Well, thank God, it is only 51 degrees here this morning!!! I was afraid it would be much colder! YEAH! Once again I woke up way too early...around 4:30am. I am so happy today is Thursday! I am about to have a successful week at work (by my standards). All is well, thus far! I can't believe Thanksgiving is next week. I guess I will be doing a little cleaning on Saturday, and then on Sunday I found that there will be a garden festival in Ft. Pierce, Florida at Heathcote Gardens... I may just HAVE to attend! I will gather the posse and go. Hope it all works out that I can. LOL. I found this pic in my archives and thought of all my northern friends and family, and even myself as our temps have dropped to a chilly 48 degrees this morning, and really all week it is expected to be cold. 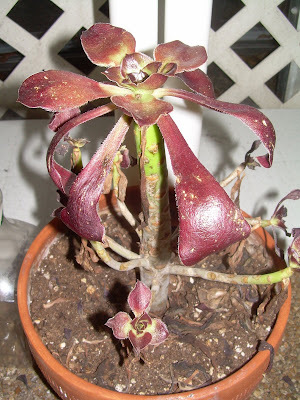 Freezing in northern Florida tonight, I heard from fellow blogger WICKED GARDENER!!! Yikes already!!! ME NO LIKE! I got a new award from Soulbrush! I would like to share this award with all of you! 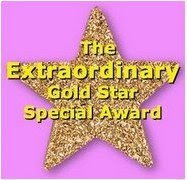 Please take it for your blog, cause you are all deserving! Share the love!!! This award is given for recognition of cultural, ethical, literary, and personal values transmitted in the form of creative and original writing...that's the general idea. I am truly honoured to receive it. *Show the image of the award on your blog. *Link back to the blog that gave the award. *Nominate other blogs that you consider deserving the same. My oldest step-son (33 years old),and his wife, have Shelby and Georgia Ann (live in Louisiana). My youngest 18 year old daughter (single, lives at home and is in college). Now, suddenly I feel older than I did a few minutes ago! LOL. Happy Cactus Monday and some Love! Well, since I am not really and artist, and had no available subjects to photograph this week, and did a little manipulation to an already existing photo! It looked much more colorful before I uploaded it to Blogger! Oh well. Hope ya'll have a terrific Cactus Monday! Last night I started trying to do a zentangle...(trying is the key word here)...and I saw a heart in the middle, so came up with this idea to shade it in. I wasn't going to publish it, but after visiting our art museum, the Norton Museum of Art in West Palm Beach, and seeing some of the artwork there, I thought...hey...my little thingy I made last night isn't SOOO bad...so I decided to share it with the world. Hope you like my little Lovetangle!!! Have a good start today for the upcoming week! Be careful, stay safe, and don't do anything too crazy! LOL. The space shuttle Endeavor launched this evening with an odd assortment of cargo—including live spiders, butterflies, and new technology to turn urine into drinking water. We walked out to our driveway (along with a lot of our neighbors) and watched the shuttle go up! We have a clear view of it here, and could actually see it for a good long while due to such clear skies and darkness. It was emotional for me, as it is each time one goes up. I can always inagine how I might feel if I were aboard! WOW! I would love to blog from space!!! 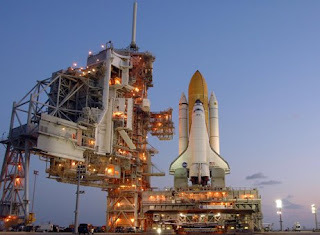 If you want to read more about this mission, click HERE! I'm sorry it has been a while since I posted! I haven't had much to say or show this week. Funny how you get into a blogging slump. I have come on to read everyone elses blogs though, which is very enjoyable in the evening after a long day at work! Today is Friday and I am so happy. This has been a tiring week, and each day I have to convince myself to go. Not that I don't enjoy my work, but that I would rather stay home with my Doozey! LOL. This dog has stolen my heart for sure! I have discovered something that I am embarrased about! I did not realize that there is a Darjeeling, India! I knew my favorite tea was grown in India, but discovered on the box, a map with Darjeeling on it!!! LOL. Boy do I feel stupid! I never was a geography whiz. Now I must go learn all I can about this magical tea place!!! 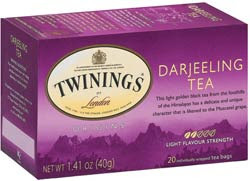 If you haven't tried Darjeeling tea...give it a try. It is very mild and smooth! Twinings describes it as a light golden black tea from the foothills of the Himalayas which has a delicate and unique character that is likened to the Muscatel grape. I like it with a little Splenda. Everyone have a wonderful weekend. The husband and I are taking a little trip on Saturday to look at possibilities for a town to retire to! Should be fun! 10 random things about me! SOULBRUSH set me up to do this tagging thingy! To list 10 random things about myself. I will attempt it, but be aware this post may take me several hours to come up with anything interesting! Please feel free to carry this process out on your own blogs, and let me know if you do...so I can come and read your responses too! 1. I won a cake in second grade. 2. My Mom bought me a new pair of shoes (Weejun Penny Loafers) for the first day of 5th grade, and by the time I had gotten home, I had already lost my shoes! To this day, we never found out where they went or where I lost them!!! I have been a forgetful person all my life...have lost purses, glasses, etc. 3. I rarely ever buy a lottery ticket, but wish I would win with the one ticket I ever do buy!!!! 4. I was a tennis team groupie in high school...I played tennis non-stop. 5. I used to play the flute in elementary and middle school. 6. I enjoy studying world religions. 7. I bought an orange Fiat Spider convertible in college and never had so much fun! I wish I still had one! 8. I love pumpkins of all sizes, shapes and forms (ie: pumpkin pie)!!! 9. I used to be a Navy Grog drinker, in my mid 20's. Here is a recipe for you, and you can tell me if you love them also! Pour liquors into an ice-filled collins glass. Add juices, shake, and garnish with an orange wedge and pineapple chunk. 10. I used to attend a Baptist college, and some nights we would go over to the outdoor chapel and swim in the baptismal pool. That was a risky, fun and invigorating time!!! OK...there you go! This was fun!!! Enjoy those Grogs, everyone!!! Here is a cactus with little birdies living inside. 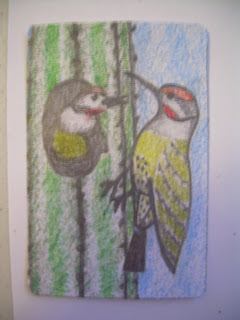 It was done with #2 pencil and colored pencils on an ATC card. This guy was inspired by my blogger pal, STAPELIAD, when she does "quick sketches" using a micron pen. I thought I would try a "quick" sketch as well, and well...here it is! I thought he turned out fairly well. Cute litle owl. Tonight my friend came down and we made cards (Thanksgiving and Christmas) from all kinds of stuff. You can see my two at the new blog I set up just to put my handmade cards on. 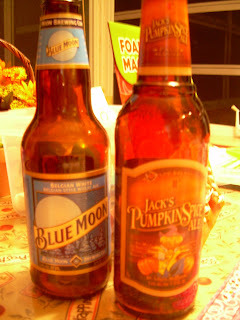 It is called My Fun Collage Cards, and we had a lot of fun drinking these two kinds of beer...Blue Moon (my fav), and a spicy pumpkin beer. After 2 of these, we sort of decided we had made enough cards...started getting a little sleepy! It was a lot of fun, and I am leaving my table just like this until we make a few more. This picture out my kitchen window shows my fantasy snow with the jasmine on the fence! You can see my couple of succulents in the windowledge, my succulent tires outside, and the Mexican sunflowers and Jasmine outside on the fence! Just thought of taking a pic to demonstrate my "snow" here in south Florida! LOLOL! Well, I walked into this little cutie bug on my kitchen sink last night. Sorry it is blurry...I still have a sucky camera! I am unable to ID it so far. I looked through BUG GUIDE and found so many black and white bugs, but not this one! I am moved to do another post one day about modern looking fashionable bugs! You have to see it to believe it! And here is a Saturday (today) blooming stroll through my yard...I love these little pewter colored berries on my lantana! 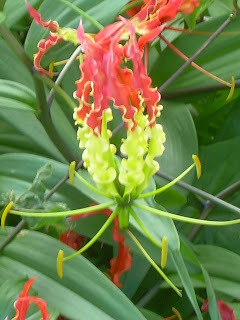 I don't think I've ever known what this is, but it is so beautiful and grows wild in my back yard...a close up and far away view for you! One of the thai plants...they are so pretty against the yellow house! 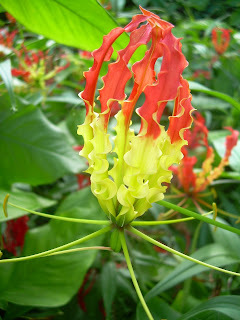 And a few shots of the Gloriosa lilies that are growing wild in my back yard too! It really is a jungle back there! They are spreading all inside a mass of a green invasive ground cover and ferns. 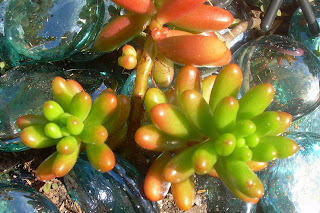 I see my little jelly belly succulents are turning more red in color due to the more intense light of fall/winter (I suppose that is it)! Sorry for this blurry shot of the top of a Mexican Sunflower bush that is about 15 ft. tall. This one belong to my neighbor, but grows over my fence. I have 5 of these bushes on the other side of my yard as well. The jasmine is all fully blooming right now, all over the chain link fence on one side of my house. I see it out the kitchen window and it looks like snow to me! (A fun fantasy)! A couple of Morning Glory shots! And last, but not least...white lantana by my front door! My new recycled tire purse!